We are currently looking for creative, enthusiastic and inspired individuals to join our team as Articles Writers! 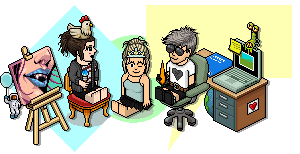 Your articles will take centre stage on habbox.com, with opportunities for you to share your topics with the forum community too to gather interest. There is plenty of scopes to get your creative juices flowing with the possibility to write up room reviews, interviews, tutorials, research-based articles and even your own take on the big news events from around the world. We are currently looking into experimenting with different styles of articles, including a more light-hearted and humorous take on things and 'BuzzFeed' style articles. If you have a passion in a certain area (such as music, film or sport) then you have the opportunity to write about a subject you love for all to see! Currently we expect our writers to produce one article per week but of course, you can write as many as you like. You will be given support, encouragement and advice along the way! If you are interested in joining our department and writing for a hobby then please fill in the following form and PM your application to FlyingJesus. Applications for Articles Writer has no set closing date and will only be closed when we believe we have filled the number of positions available. If you have any queries regarding applications then please PM Sho. Last edited by Sho; 14-10-2018 at 12:31 PM. Christmas is nearly here and we have so much to write about, which means, you TOO could be writing great articles for Habbox. Remember to get applying everyone!